There are no surprises here. This is the next recommendable installment in Goode and the Orpheus Chamber Orchestra's continuing series of Mozart piano concertos. The earlier releases have received favorable reviews, and the newest one probably will receive a similarly warm reception. In terms of interpretation, nothing unusual happens on this disc. There's no revisionist thinking, just honest and highly accomplished musicianship. The biggest challenge to be faced here is the superficial similarity between these two concertos. The F Major concerto was written in 1784, and it is thoroughly sunny. Only in the Allegretto does Mozart allow a few clouds to cross the sky, and they are not particularly dark ones. The B Flat Major concerto, written in 1791, was Mozart's last piano concerto, and his last concerto but one. (Only the Clarinet Concerto followed it.) It is the F Major work's older and wiser brother, a little less skittish, a little more regal, and somewhat more bruised by life's assaults. Still, it keeps smiling and reassuring the listener that all is well, even if we suspect that this is not completely true. In my previous review of a disc from this series, I referred to the Orpheus Chamber Orchestra as a conductor-less ensemble. That may be true, but I failed to consider the possibility that Goode was conducting them from the piano, as Mozart himself would have done. Whatever the case, Orpheus Chamber Orchestra is completely satisfying. As I said before, the playing is full of small, illuminating touches – nothing earth-shattering occurs in the orchestra, but the members get the job done. 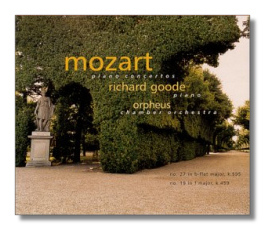 Goode is a purposeful, sensitive Mozartean. Without mincing, he makes the rhythms come alive, and he finds the music's lyricism while staying within its Classical boundaries. He plays Mozart's cadenzas in both of the concertos. The recording was made in 1996 in New York's Manhattan Center. As with the performances, there's nothing here that calls attention to its self except for the overall sense of capability and integrity. The annotations are by Harris Goldsmith, who is given ample space to write intelligently about both of these works and their milieu.